The baddest guy you never heard of…. He wasn’t Bruce Lee or a Gracie and if you were weren’t one of the handful of people to ever train with him or get his videos you would have never known his genius or his toughness. He was my instructor, mentor and Godfather of my eldest child. His name was Carl Cestari. Carl was best known for his knowledge of World War II Combatives and got some notoriety when Black Belt Magazine named him one of the “20 Toughest Men to Ever Live“. But he was much more than that. He was a martial artist, soldier, police officer and convicted murderer. No one before or since has possessed this rare combination of intelligence, training and REAL WORLD experience like Carl Cestari. Bruce Lee had two known street fights, Carl had many. The Gracies fought in the ring, Carl served his country and community and survived prison as an ex-cop. If you had any street smarts you knew after the first second of meeting him, that Carl was not to be taken lightly. But if you spent any period of time with him you would discover he was humble, generous, caring, well read and extremely intelligent. He can never be replicated or replaced. Carl Cestari died on July 23rd, 2007 at the age of 49 as a result of complications from cancer. 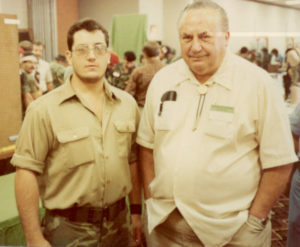 Carl P. Cestari was born in Coventry, England to an American Serviceman, Carl Panero, and an English mother. It’s not clear the marital status of Carl’s biological parents, but the story goes that once his mother was incapable of raising him, she put him in an orphanage. Upon hearing this, Carl’s father took him from the orphanage and brought him on a military transport to the United States without documentation. “Baby Carl” was left with his aunt and uncle in New York City. Carl took the last name Cestari from his adopted family. Carl’s biological father was rarely around. There were rumors he was involved in US Intelligence and died while building a hunting lodge in Somalia. Damian Ross, David Ellis, Carl Cestari and Yoshisada Yonezuka at Damian’s Judo Black Belt promotion. Carl’s family moved to New Jersey where his first Martial Arts instruction was Judo at the age of 9. His first instructor was a former serviceman who learned Judo during his time in the armed forces. The school was in a small apartment above a television repair shop close to the Cestari home. On occasion his instructor would take his students to the Cranford Judo Karate Center in Cranford, New Jersey. This school impressed Carl greatly. Soon after Carl started training there full time. 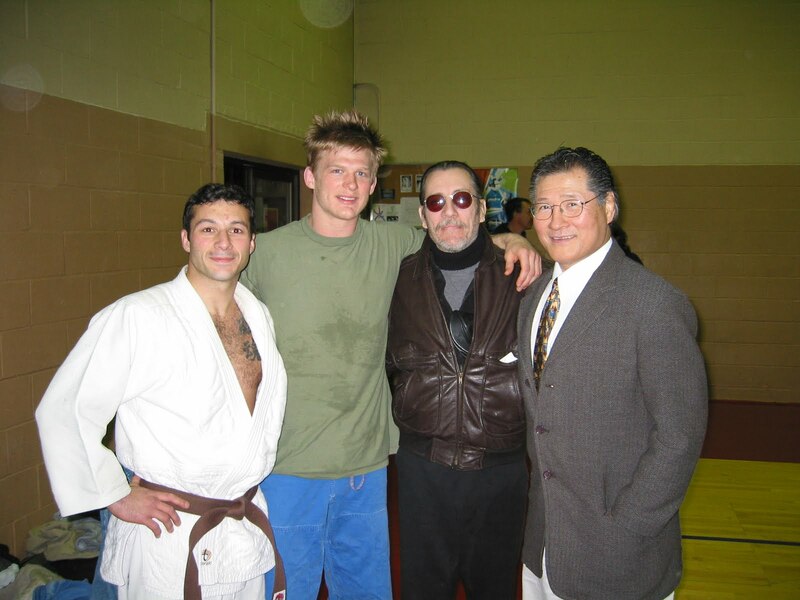 The Cranford Judo Karate Center was owned and operated by world renowned instructor Yoshisada Yonezuka. Carl would earn first degree black belts in Shukokai Karate and Judo under Yonezuka. He trained with Yonezuka (Yonne) almost exclusively from age 9 to 18. Throughout his life, he always found his way back to the Cranford JKC and considered it home. Carl’s study and practice of martial arts spanned his whole life up until the day he died. 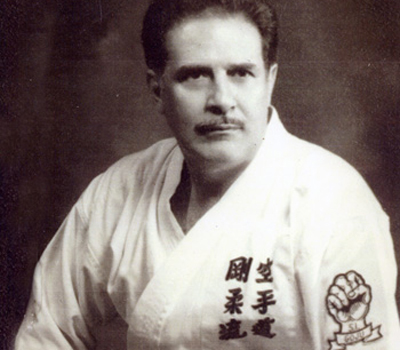 He studied anything in which he found value like Boxing, Wrestling, Sambo, Karate, Kung Fu, Savate, Kick Boxing and many types of armed combat disciplines just to name a few. Not only did he study the techniques but the psychology, history and context were thoroughly explored. His study wasn’t just limited to the popular eastern traditions, he also conducted research into western pugilism and early forms of western martial traditions like Bare Knuckle Boxing. Carl wouldn’t just read books or watch videos either. He would seek the greatest authority in the discipline and if possible, he would train with them. 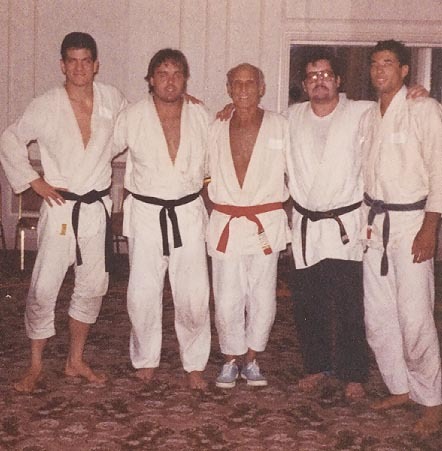 Carl (second from left) in 1989 with his arms on Helio and Royce Gracie. There wasn’t a fighting system on the planet that Carl didn’t investigate. In the mid 1980’s Brazilian Jujutsu began to get noticed. Carl took the opportunity to attend a Brazilian Jujitusu Seminar hosted by Helio and Royce Gracie. He made it a point to say that the Gracie’s were generous, kind and of course, tough. He had a great deal of respect for them. In 1977 at age 18 Carl enlisted in the Army and became a Ranger. After an honorable discharge in 1980, he joined the Roselle Park Police Department in Roselle Park, NJ. Since “Hot” burglary’s (armed suspects still on scene), bar brawls and other violent offenses were the norm, Carl kept training hard and heavy in both the martial arts and lifting weights. Carl sought any type of training that would help him survive. It was this time he searched for the truth about self defense and close quarters combat since the tactical training he received in law enforcement and the military was inadequate for real world violence. He would comment that in the late 1970’s the Rangers were teaching Tae Kwon Do as the preferred method of hand to hand combat. Carl was what you would consider a “Mixed Martial Artist” with black belts in karate, judo and an instructor’s certificate in boxing, one would agree by today’s standards, he had an excellent set of skills. One night while on patrol, a call came in about an extremely violent bar brawl. Carl and his shift commander were the first officers to arrive on scene. They found the entire bar (a biker wedding gone bad) had erupted into brutal fighting. Carl and his commander began to separate the fighters and the non-combatants. Carl with his martial arts training, found himself slugging it out and grappling with every subject he tried to remove while his commander, who looked like your typical “doughnut eating” cop, was simply breaking up fights with a strike here and a strike there, getting people to comply and moving them out. Moments later help arrived and the situation was under control. Carl found himself sweating and exhausted with his uniform shirt in tatters. His commander on the other hand, the “overweight, older guy with a cigarette hanging lazily from his mouth” not only had his uniform intact but he had barely broken a sweat! Carl couldn’t comprehend how he, with his many years of training, looked no better than the people he was arresting while this other guy, who looked like he couldn’t do a push up, had not only “taken care” of more subjects than he, but that looked unscathed. Carl would later discover that his commander was trained in in hand to hand combat during World War II. 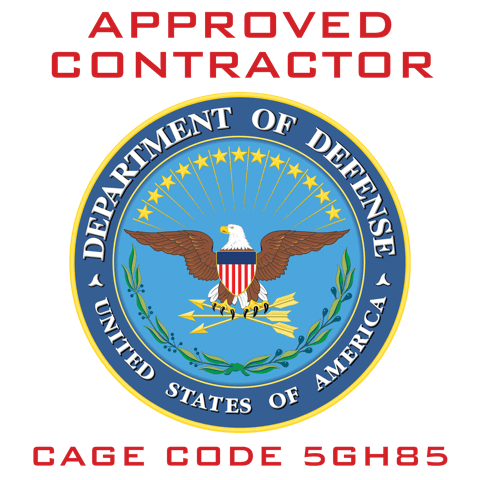 He recommended Carl read a book on Close Combat for the Seebee’s (American Combat Engineers). Carl found the book and read intensely. This discovery began his search for information on close combat instruction of the World War II era. He had learned a lot from the martial arts, but they only trained him how to fight not how to survive. Carl sought out people who had both martial arts training and real world violence experience. He met a lot veterans who had served in Special Forces during World War II and other “small wars”. 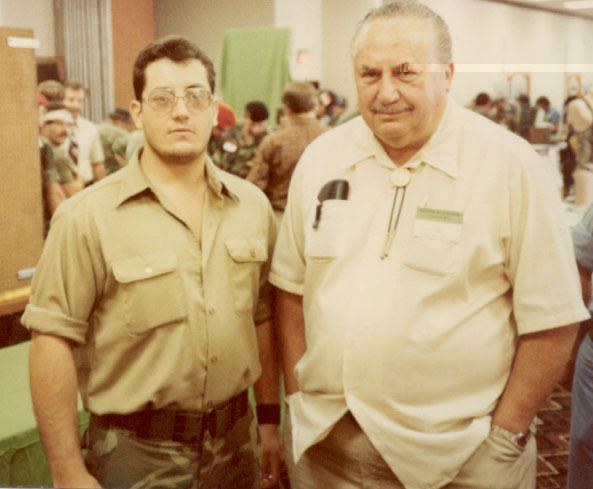 Some of the people he spent time with were John Kuhl, Brad Steiner and Pete Sirangano, Sr.
All of these men had come to the same realization as Carl – Combat arts were no longer combat orientated. 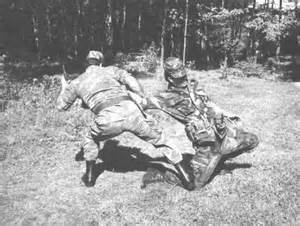 No matter what system he looked at, he always kept coming back to the World War II era methods of hand to hand combat. As a result, Carl began collecting research and books of close combat from this era. It was shortly after the bar brawl situation that Carl met former Marine Robert Kasper. Kasper came to train in Karate at the Cranford School where Carl was instructing. The two found each other to be hard training individuals and became fast friends. They shared the same passion about realistic self defense with little interest in the art and sport of martial arts. 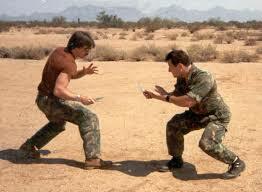 It was at this time their research lead them to former USMC Self Defense Instructor Charles Nelson. When Bob and Carl first entered Charlie’s school they found a small man around the age of 60 sweeping the floor. Given his appearance, they assumed he was the janitor. It was hard to believe that such a slight man could climb a flight of stairs let alone teach brutal self defense. This obviously surprised them, but finally Carl relented and gave a half hearted attack. Charlie snapped back with “REALLY ATTACK ME!! !” followed by a smack to the side of Carl’s head. With his ear still ringing, Carl lunged with the knife thinking, “OK, if I kill him, we’re out of here!” but before Carl even moved, Charlie spit in his face, stepped to the side and almost knocked him unconscious with an edge of hand strike to the side of the neck. Needless to say they signed up for lessons immediately. They had finally found a real “street” teacher. For a brief time Carl and Bob had their own instruction company called “Personal Survival Tactics”. Both were working full time but had a lot of fun teaching some small groups and individuals. Even though it was a short time, it wasn’t without some good stories. Like the time they rappelled from the roof of a hotel only to find a patrol officer wandering in the landing zone…imagine his surprise when they tossed smoke grenade! Bob Kasper (left) with Carl Cestari (right) caught sniper fire during this desert photo shoot. Another time didn’t have such amusing consequences. While taking photo’s an unknown desert sniper took shots at them. Needless to say, the photo shoot was cut short. This time in Carl’s life has been largely ignored by many people but you would not understand the man without knowing this part of his life. In 1982, with less than two years on the Roselle Park Police Department, Carl decided he wanted to return to the Army. At a party given in his honor, he accidentally shot and killed a fellow officer while taking a picture. It was the testimony of close friend and training partner Bob Kasper that was key to Carl’s conviction. Carl went to prison in 1983 and was released in 1989. Bob and Carl were estranged for almost 15 years until they reconciled before their respective deaths. Carl’s experience in prison only further validated his methods and his ability to survive violence. He was only 25 years old, basically a kid by today’s standard. As an ex-cop, he was a target of the inmates and as a cop who killed another cop, he didn’t receive any protection from the guards. Carl literally was on his own and YES there were many times he had to fight for his life. 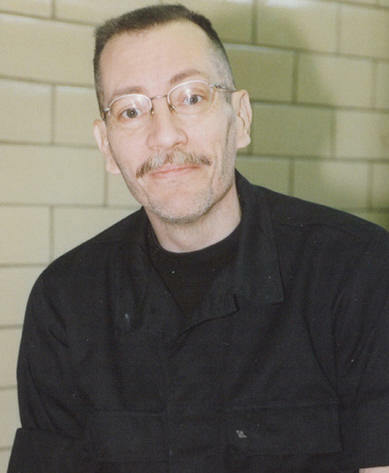 Upon his release in 1989, Carl began working construction, security, odd jobs and teaching. He taught wherever there was space – his basement, the basement in Al’s Deli, Cranford JKC and the basement of the Mission Church in Paramus, NJ were just a few. He never taught in one place for more than a handful of times. His Instruction attracted police officers, security personnel and anyone who had to deal with real violence or just wanted to know the truth about close combat. Carl’s Decline in Heath and Untimely Death. Around 1992 Carl was diagnosed with diabetes. Over the next few years he had gone from as solid 220 pounds to meager 145 pounds. His failing body severely restricted his ability to train and teach. Problems with his circulation meant that some of his fingers had to be amputated. In 2002 Carl and Damian Ross developed Tekkenryu Jujutsu. This was the culmination the World War II military combatives and the martial arts Carl dedicated his life learning. Tekkenryu began with combatives. The reason for this was simple – adults don’t want trophies, they want to know how to protect themselves and their loved ones and you don’t need a black belt to do that. Carl and Damian understood that most adults wouldn’t be able to train for more than a few months so if anyone trained in Tekkenryu, even for just a few weeks, they would have working self defense skill and knowledge. The Self Defense Training System (SDTS) is the realistic self defense and close quarters combat from Tekkenryu Jujutsu. As the years passed Carl’s health became progressively worse. Carl’s will to live kept him alive far longer than the doctors predicted. Carl finally lost that battle on the 23rd of July 2007. There is confusion about Carl’s life, but this timeline limits the possibilities of what he did and where he was. *Carl had several other certificates and ranks, most of which were ceremonial and honorary. Some may have been misplaced on the timeline due to conflicting stories. 1999 – 2006 Active on internet forums, filmed videos with Damian Ross conducted only a handful of seminars and training sessions due to illness and rapid decline in health. 2007 – Deceased age 49. Carl’s view of self defense came down to two things – your will to survive and your will to do what ever is necessary. From the moment I met Carl as a young man I knew he was someone to emulate. Everything I did from a training perspective was modeled against his experience. For those of you who didn’t know him, now you do. A fascinating story, Damian. Thank you. Thanks, Damian! This story reminded me of something that you said in a post or on one of your DVD’s. You said that in spite of all of your formal training in various martial arts, the techniques that were the most effective (and maybe the only ones that you used) when you were a bodyguard were the same ones that you so generously and thoroughly teach us through your awesome DVD’s! They are simple, easy to remember, and logical. We can all learn from someone like you who has such a long list of positive influences and mentors. Thanks for teaching us the skills needed to keep ourselves and our families safer! Thanks and that’s means a lot. Thanks for sharing Cestari’s and your training with us. A pleasure. What was his cause of death? Was it the diabetes? The videos that Carl done in the church basement on the Fundamentals Of Unarmed Combat were the most astounding level of orderly clear and precise free flowing concepts of teaching I had ever seen not just in martial arts but anywhere! He was unbelievably intelligent and his method of teaching should be the template for how to teach anything anywhere! He reached a level of physical and intellectual mastery that very few people ever will.I’d like to thank him here for the privilege of watching him and the price and effort he paid to reach such a level.And thanks to Damian for keeping the flame of truth going. And you should know…ALL OF THAT WAS UNSCRIPTED. Just one continuos stream of consciousness…incredible. Wow. God rest his soul. 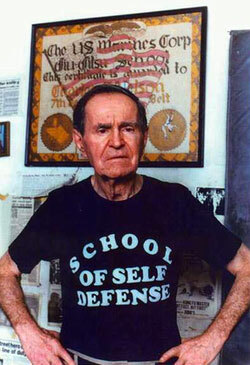 i also went to the charles nelson school of self defense and can validate everthing you said about charles nelson…..he was a great teacher too…. Welcome to the Team Jashawn. Hey Buddy!, I found this information for you: "Carl Cestari Unofficial Biography". Here is the website link: https://www.myselfdefensetraining.com/carl-cestari/. Thank you.